Teething can be a tough time for babies and parents - it is so be hard to watch your baby in pain with sore gums. East London Baby Co's products have been specifically designed to soothe the gums, satisfy the desire to bite (saving your arm, face, fingers and nips - you're welcome!!) and help to distract the baby from the pain. The materials are also safe to put in the freezer for extra soothing power! East London Baby Co's teething necklaces have different sized and shaped beads - chosen to be interesting for baby and to help the necklace soothe all different-sized, aged and shaped mouths. The silicone material used is the same as is used in traditional teething toys and bottle teats - flexible and springy to allow for a really great chew. The cord is made from super-strong nylon - although not designed to be chewed constantly, it's very strong and washable. You can take a look at some of the teething necklaces in our single Strand and double strand collections and choose your favourite. East London Baby Co bangles are the perfect shape and size for small hands and have an interesting geometric shape - great for encouraging babies to put it into their mouths. 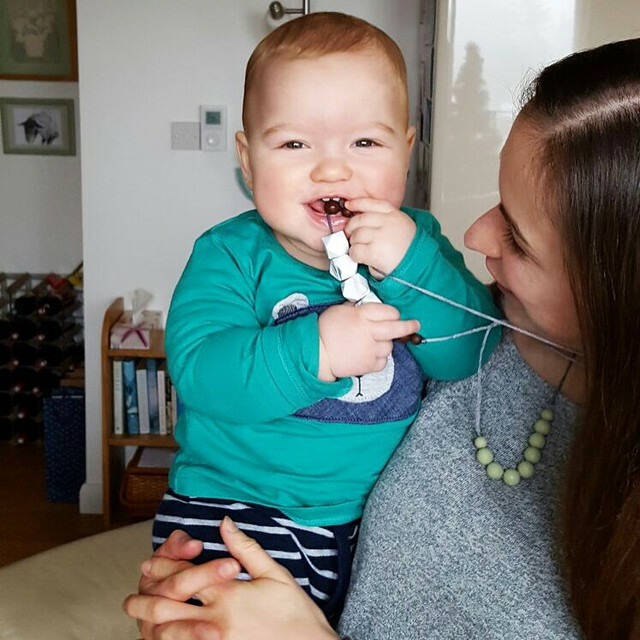 Made from the same silicone as the necklaces, the bangles are totally safe to be given to babies to chew as you would a teething toy - the perfect go-anywhere teether!